Thirty years ago Sam Bowles, David Gordon and Tom Weisskopf published a book with a provocative title, Beyond the Waste Land: A Democratic Alternative to Economic Decline (1983). (Barry Bluestone and Bennett Harrison’s Deindustrialization of America: Plant Closings, Community Abandonment and the Dismantling of Basic Industry (1984) sounds similar themes from roughly the same period.) The “waste land” title seemed perhaps a bit apocalyptic when it appeared during an earlier period of economic stress in the United States and the early expression of the free-market fundamentalism associated with Reaganism. How does it look today in 2013? The book has a simple argumentative structure. It documents a grim view of the economic situation of America in the early 1980s; it offers a critique of “trickle-down” economics; and it provides the architecture of an alternative. Bowles and his co-authors describe their alternative as a more democratic approach to modern economic life, and it focuses on what they refer to as an economic bill of rights. The most striking of their recommendations involves the idea of a right to a job. What they mean by this right is that specific affirmative steps need to be taken, in managing the economy, to achieve “full employment” — a level of employment that ensures that anyone seeking a job can find one. They distinguish between job security — keeping the job one currently has — and employment security — having confidence that one will find a job somewhere in the current economy. The former demand implies economic rigidity, whereas the latter is compatible with substantial economic flexibility. They accept the point that achieving this goal will often mean creating a program of public employment. In addition to a government-backed right to employment, BGW argue for substantial institutional reforms in the direction of ensuring greater workplace democracy. This might take the form of expanded roles for labor unions in the organization and direction of the workplace, or it might look more like the systems of works councils found in various European countries (link). They believe that greater workplace democracy is likely to increase labor productivity, as workers have a stronger incentive to work efficiently and intelligently. These policy recommendations may have appeared difficult in 1983; they seem wildly unreal in the context of mainstream American assumptions today about the way a market economy works and the role government should play within that economy. 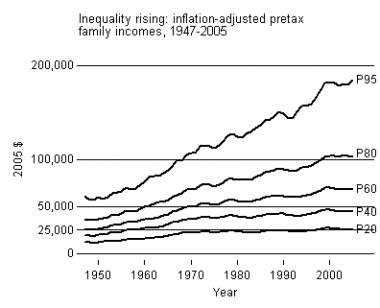 The picture that Bowles, Gordon and Weisskopf offer of the economy of the 1980s is bleak. But on the dimensions of slack economic growth, high unemployment, and stagnant incomes for the great majority of the working population, the evidence of the past ten years seems to be even worse. The graph at the top seems to document that reality: slack growth for low and middle income workers has persisted, and inequalities have continued to increase since 1980. What is striking in rereading the book is how refreshing it is to find a critical view of the basic structures of the post-war economy that highlights imbalances of power and income as the key problems. It is hard to think of a serious economic analysis of our current conditions that is as honest in confronting these fundamental structural realities. And yet the solutions that BGW offer don’t seem to be very promising today. So we urgently need to pose the key question: What are the reforms within our contemporary economic institutions that can help to bring up the incomes of the bottom sixty percent of our society and help to compress the growing inequalities of income that we have witnessed in the past twenty years? How can we achieve growth with equity and a decent quality of life for all Americans? And where are the bold thinkers who can help us answer these questions? « How to probe public attitudes?